Sydney, NSW, 4 January 2018 – After a successful period in the inner Western suburb of Glebe, Burger 10 has found its second home at Randwick ‘s jewel crown ‘The Spot’ on 45 Perouse Rd opening its doors on Friday, 12 January 2018, 11:30am. In celebration of the grand opening, Burger 10 is offering 50% DISCOUNT ON YOUR TOTAL BILL from opening weekend, 11:30 am Friday the 12th until the close of trade Sunday the 14th January 2018. They’ll bring their award-winning multi-national burger menu with them along with new and exciting features such as Fried Chicken, Nachos & Quesadillas, soft serves, and milkshakes. The creative concept invites you to taste your way around the world. The menu features 10 uniquely crafted burgers bringing the flavours of ten different countries from the likes of China, Thailand, Italy, Greece, Lebanon, Australia, Mexico, Japan, Morocco and of course America. 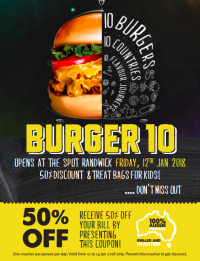 Burger10 Randwick grand opening is taking place on Friday, 12 January at 45 Perouse Road and will feature a 50% DISCOUNT ON YOUR TOTAL BILL and treat bags for kids, so hurry and don’t miss out! Burger10 would like to invite you, the media, to come down and join us and help celebrate this momentous occasion.